Ok, it was a little cold when we arrived at the trailhead near Carson Pass at 8:30am in the morning. The weather forecast had predicted freezing temperatures, but it did not mention the wind that made those already very cold temperatures even colder. But we had rented a car from the Sacramento airport, driven two hours to get here, and therefore a little wind could not slow us down. After putting on every last piece of clothing we could find, we headed out at 8:45. It was a sunny day and fifteen minutes into the hike, we could already see our destination in the distance. Some snow had covered it over night (or maybe the night before) and it looked quite magnificent. Almost no clouds were visible and the few clouds we did see were blown out of sight quickly by the fierce winds. Pretty soon we passed Frog Lake and left the Pacific Crest Trail to head south into the direction of Winnemucca and eventually Round Top Lakes. The former we reached after an hour and rested briefly for a power bar and a little bit of water. The only way to stay warm was to keep moving and therefore we continued on the trail, which now inclined slowly. After fifteen minutes or so, we left the trail and aimed at the saddle between Round Top and one of the Sisters. We walked a little bit through the snow, buy it did not cover the ground evenly everywhere because it had drifted into heaps that were 3-4 inches deep. We spent barely enough time to east a sandwich, take plenty of pictures of the beautiful surrounding scenery and take care of Flo’s bleeding hand before the wind forced us of the mountain. Heading down to the saddle I repeated my intention to climb the Sisters as well. But both Alex and Flo opted to head down to Round Top Lake, where they would look for a protected sunny spot and wait for me. As an attempt to encourage them to follow me up to the sisters I offered them one of my gloves, but Flo replied that it was not just his hand that was called but that he was chilled to the bone. 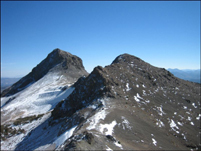 I said I would do the traverse as fast as I could and jogged across the saddle up to the eastern-most and highest summit of the Sisters (10,153). The following traverse was a constant up and down as I tried to stay as much on the ridge as possible, but none of it was harder than class 2-3. It was a fun scramble and the views south and north (where I could make out Alex and Flo) were very nice and about 40 minutes after setting out on it I reached the end of the traverse and arrived at the trail on the western end of Round Top Lake. I shot a couple more pictures of Round Top and then walked back to the agreed meeting point. While doing so, I hiked right passed Flo and Alex who were resting at the base of a fascinating dead tree. Flo had to run after me to get my attention. I joined them for another 10 minutes at the base of the tree, before we started to hike back to the trailhead. There were noticeably more people on the trail by now. We had only met two hikers on our way up, but saw at least 20 hikers on our way out. Shortly after Winnemucca Lake, Flo and I swerved right to climb Elephant’s Back on our way back to the trailhead. Alex decided to head straight back to the car. The little excursion cost as a mere 15 minutes, and even though we jogged back the final mile, Alex was deep asleep when we reached the car at shortly before 3. Two other highlights of that day were the visit to the Grover hotsprings after the hike and the drive back on the Mormon Immigrant Trail. The later road connects CA-88 with CA 50, but I had never taken it thinking that it must be very windy and very slow to drive on. In fact it is very straightforward, doesn’t see a lot of traffic and enables a fairly quick “jump over” from 88. It is closed in the winter, but on one of my next trips I plan to time it versus the 50/89 approach to Hope Valley. We also enjoyed the fall colors everywhere in that region.